The cardiac monitor is a device that shows the electrical and pressure waveforms of the cardiovascular system for measurement and treatment. Parameters specific to respiratory function can also be measured. Because electrical connections are made between the cardiac monitor and the patient, it is kept at the patient's bedside. The cardiac monitor continuously displays the cardiac electrocardiogram (EKG) tracing. Additional monitoring components allow cardiovascular pressures and cardiac output to be monitored and displayed as required for patient diagnosis and treatment. Oxygen saturation of the arterial blood can also be monitored continuously. Most commonly used in emergency rooms and critical care areas, bedside monitors can be interconnected to allow for continual observation of several patients from a central display. Continuous cardiovascular and pulmonary monitoring allows for prompt identification and initiation of treatment. The monitor provides a visual display of many patient parameters. It can be set to sound an alarm if any parameter changes outside of an expected range determined by the physician. Parameters to be monitored may include, but are not limited to, electrocardiogram, noninvasive blood pressure, intravascular pressures, cardiac output, arterial blood oxygen saturation, and blood temperature. Equipment required for continuous cardiac monitoring includes the cardiac monitor, cables, and disposable supplies such as electrode patches, pressure transducers, a pulmonary artery catheter (Swan-Ganz catheter), and an arterial blood saturation probe. As the cardiac monitor is most commonly used to monitor electrical activity of the heart, the patient can expect the following preparations. The sites selected for electrode placement on the skin will be shaved and cleaned causing surface abrasion for better contact between the skin and electrode. The electrode will have a layer of gel protected by a film, which is removed prior to placing the electrode to the skin. Electrode patches will be placed near or on the right arm, right leg, left arm, left leg, and the center left side of the chest. The cable will be connected to the electrode patches for the measurement of a five-lead electrocardiogram. Additional configurations are referred to as three-lead and 12-lead electrocardiograms. If noninvasive blood pressure is being measured, a blood pressure cuff will be placed around the patient's arm or leg. The blood pressure cuff will be set to inflate manually or automatically. If manual inflation is chosen, the cuff will only inflate at the prompting of the health care provider, after which a blood pressure will be displayed. During automatic operation, the blood pressure cuff will inflate at timed intervals and the display will update at the end of each measurement. Photograph by Hank Morgan. Science Source/Photo Researchers. Reproduced by permission. occur once the patient is comfortably positioned since the transducer must be level with the measurement point. The pressure transducer will then be connected to the indwelling catheter. It may be necessary for as many as four or five pressure transducers to be connected to the patient. The arterial blood saturation probe will be placed on the finger, toe, ear, or nasal septum of the patient, providing as little discomfort as possible, while achieving a satisfactory measurement. After connecting all equipment, the health care provider will observe the monitor and evaluate the quality of the tracings, while making size and position adjustments as needed. The provider will confirm that the monitor is detecting each heartbeat by taking an apical pulse and comparing the pulse to the digital display. The upper and lower alarm limits should be set according to physician orders, and the alarm activated. A printout may be recorded for the medical record, and labeled with patient name, room number, date, time, and interpretation of the strip. Maintenance and replacement of the disposable components may be necessary as frequently as every eight hours, or as required to maintain proper operation. The arterial saturation probe can be repositioned to suit patient comfort and to obtain a tracing. All connections will be treated in a gentle manner to avoid disruption of the signal and to avoid injury to the patient. 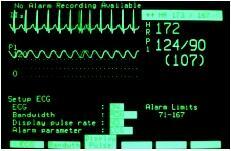 The monitor will provide waveforms and/or numeric values associated with the patient status. These may include, but are not limited to, heart rate, arterial blood pressure, central venous pressure, pulmonary artery pressure, pulmonary capillary wedge pressure, left atrial pressure, cardiac output, arterial blood saturation, and blood temperature. Furthermore, these values can be used to calculate other values, or parameters, or used to diagnose and treat the patient's condition. Patient movement may cause measurement errors; the patient will be requested to remain motionless. Depending on the mobility of the patient, assistance should be provided by the health care provider prior to changing from a laying down position to sitting or standing. As the patient's condition improves, the amount of monitoring equipment may be decreased. However, the electrocardiogram and arterial blood saturation probe should be expect to remain attached until discharge is imminent. Cahill, Matthew. "Providing Cardiovascular Care." In Nursing Photobook. Springhouse, PA: Springhouse Corporation, 1996. Marriott, Henry J. L. Pearls and Pitfalls in Electrocardiography: Pithy, Practical Pointers, 2nd ed. Baltimore: Williams and Wilkins, 1998. Milford, Cheryl, and Gladys Purvis. "Cardiovascular Care" In Nursing Procedures, 3rd ed. Springhouse, PA: Spring-house Corporation, 2000. Skeehan, Thomas, and Michael Jopling. "Monitoring the Cardiac Surgical Patient." In A Practical Approach to Cardiac Anesthesia, 3rd edition, edited by Frederick A. Hensley, Donald E. Martin, and Glenn P. Gravlee. Philadelphia, PA: Lippincott Williams & Wilkins, 2003. Woods, Susan, and Erika Sivarajan. Cardiac Nursing, 4th ed. Philadelphia: Lippincott, 2000. Perry, A., et al. "Measuring the Costs and Benefits of Heart Disease Monitoring." Heart 83 (June 2000): 651–656. American Association of Critical-Care Nurses. 101 Columbia, Aliso Viejo, CA 92656-4109. (800) 899-2226. http://www.aacn.org/ . American Heart Association. 7272 Greenville Ave., Dallas, TX 75231-4596. (800) 242-1793. http://www.amhrt.org . Applied Biometrics. P.O. Box 3170, Burnsville, MN 55337. (952) 890-1123. Advanced Cardiac Monitoring: Ventricular Ectopy vs. Aberrancy. Videotape. RamEx, Inc.
ola . gostaria de fazer uma pergunta. gostaria de saber se ou o que se pode ocorrer se os sensores do eletrodos nao forem colocado na forma correta das cores . o que pode ocorrer? com o paciente ou com o monito? we need side bed cardiac monitor . we don't have any details about this product kindly suggest us your best product models. How long is the data like blood pressure, pulse etc can be stored on the cardiac monitor?